Not much for animated movies but this one has a great story and great voice acting. Really an adult-oriented lesson story with dialogue that most little kids wouldn't 'get' without parental guidance. Animation is excellent. It was very entertaining; while appreciating how differences affect our lives. Entertaining and held you from beginning to end. It was a cute movie and a fun family film. Very cute movie, a bit long. We loved this mocie. My 9 year old son learned a lot about how we all should try to get along even though we may have differences from others. The movie was funny and showed feelings of love. 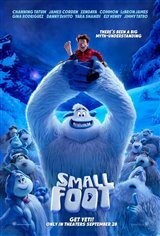 It would be great to have a Small Foot 2 . I was surprised that it was an animated, musical movie. A big thumb up! Light-hearted, funny, and nicely entertaining. The anti-religion theme was a bit off-putting, but when you see it was a conspiracy, not a religion, it settles back into a thoroughly enjoyable movie.